Friday, April 12 – Soccer Practice, 2:15-3:30 p.m.
Tuesday, April 16 – Lower Elementary Presentations, 7 p.m.
Wednesday, April 17 – Newspaper Club, 7:35 a.m. Break and is in Mrs. Bushhouse’s class. Welcome, Bethany! during each building’s snack time. All proceeds will be given to the local charities selected by the students. Thanks so much for your support! Riverside’s Homerooms in the Main Building (Mayer, Myers, Waldenmaier and Shoop) are looking forward to presenting their projects to their families on Tuesday, April 16 at 7 p.m. The program should last approximately one hour. Siblings and extended family are welcome. on Tuesday, May 7 at 7 p.m. The program should last approximately one hour. Siblings and extended family are welcome. A must-listen: There is a insightful new podcast featuring Riverside’s own acclaimed instructor Cynthia Davis, Fellow, AOGPE and Riverside’s O-G Coordinator, talking truth about dyslexia and incredible voices from Riverside’s kids’ panel. This wonderful podcast was produced by author Gary Karton and Sa Kids Worldwide. This will ‘wow’ you! Join Riverside’s award-winning Studio Arts teacher Christy Lantz for ‘Purposeful Play and Tinker Trays’ Art Club. The dates are April 17 and 24, as well as May 1, 8, 15 and 22 from 3:05-4:30 p.m. in the Riverside Art Room. Please note that the class is limited to the first 12 students and is for children in grades K-3 only. The cost is $100. Please click here for more information and the permission form in order to register. Upon completion, the form needs to be turned in to Riverside’s front office with payment to be placed on the list for Art Club. Please note that we are not sending home a paper copy to parents, so please take time to print / complete the permission form and register. Virginia Outside will hold an afternoon of fishing at the University of Richmond. Pick up and drop off will be at Riverside School. Virginia Outside will provide all the equipment. No experience is needed—just pack your smile and a sense of adventure! The session is from 12-2:30 p.m. and cost is $30. 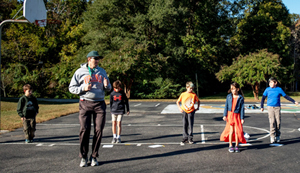 RIVERSIDE’S FIELD DAY IS DESIGNED TO BE AN ALL-SCHOOL, afternoon activity in which students will have fun, practice good sportsmanship, and demonstrate the skills that they have developed in the physical education program. Field Day will take place on Wednesday, April 24, from 11:30 a.m. until 2:45 p.m. The rain date is May 1. All events will take place on the athletic field and blacktop behind the school. Students will be divided into eight teams of mixed grade levels. Each team will be chaperoned by one teacher and one parent. The teams will be named for colors (red, green, orange, blue, gray, yellow, white and brown) and students and chaperones will wear the colors of their team. Although the teams will not be directly competing against each other, team-building will take place, with students cheering on and encouraging other members of their team. There will be nine events and all teams will compete in each event simultaneously, in order to minimize downtime. Please note: Riverside will be sending home information with your child regarding team assignments via hard copy. THANK YOU FOR YOUR DONATIONS to the Richmond area’s book collection. Your families provided 520 books to the Northside Medical Center and pediatricians. These books will provide pleasure reading for many throughout the metro area. Your generosity is most appreciated. Because of the support of caring organizations and people like you each year across the state of Virginia, more than 121,500 children, ages six months to 5 years old, are preparing to succeed in school with the help of their pediatricians and Reach Out and Read. Riverside’s Day at The Diamond is on Sunday, May 5. The Richmond Flying Squirrels will play the Altoona Curve at 1:05 p.m. This is a fundraising event for Riverside. Please click here for details. More information to follow. WE ARE OFFICIALLY ONE MONTH OUT from the Bon Air Victorian Day parade (Saturday, May 11) and we’d love to have you march with us! We will gather at Bon Air Baptist Church at 10 a.m. to line up for the 11 a.m. parade. We are asking each family that participates to bring a bag of candy to throw out to the spectators along the parade route. Please send me an e-mail if your family plans to join in on the fun. For the rest of the year, I will be including the current level of parent participation in the Annual Fund Campaign. We are currently at 40 percent. Remember, if we can get to 100 percent like we did last year, Riverside will receive a $5,000 challenge grant. THIS PAST WEDNESDAY, we had yet another amazing Adult Dyslexic Speaker come to our Morning Assembly. Her name is Courtney Ferrell, and I saw her speak at a recent VAIS event about creativity and joy. She mentioned her own dyslexia in her talk, and when I shared that I worked at a school specifically for students with dyslexia, she was very enthusiastic about coming out and meeting our students. Unfortunately, we don’t have a full video of her visit to Riverside, but if you Google her name, you will find a number of videos of her TEDxTalks and other presentations she has done. Here is a recent video of hers focusing on creativity, which was one of the topics when she came to Riverside. Click here to view the video. And while I am promoting media, an excellent podcast featuring some of our students, as well as our very own Orton-Gillingham Fellow Cynthia Davis, can be found in the ‘News and Notes’ section of this e-newsletter, on our Facebook page, our Twitter handle, or by clicking on the badge on the top of our website at: https://www.riversideschool.org. I had the pleasure of meeting Gary Karton when he visited our school and recorded the podcast, and I think he did a great job of capturing some of what makes our school so special.